This morning Adelynn was excited for school. She does not know what school is about yet but she sure was excited because her sisters were excited. Although I missed getting the big 7th grader's picture I did manage to snap a shot of my 5th grader. Not to be left out Adelynn made sure she too had on a backpack for this special day. Eager to go where ever her sisters go she raced down the walk ready to go to school. Together we walked Olivia to the corner and watched her walk to school with her friends. This was not what Adelynn expected. She was fully ready to go with all the other children. As we made our way back home I began to consider this year. Soon Adelynn will be two. 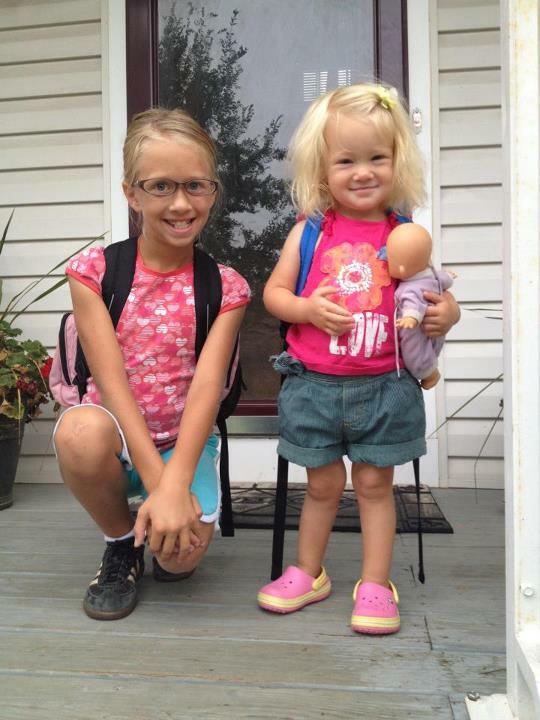 Olivia is in her last year of elementary school and Leah is on her second year of middle school. Where does the time go? Five years ago we moved to this area and it was Olivia taking her first walk to the big kid school with her big sister leading the way. Today she walked off with confidence eager to get back to learning to see her friends to be her own self. And Leah, well she was up and gone before Adelynn woke up for the day. Leah charged out the front door eager to see her bus stop pals and meet her new classmates. Old routines by now. Changes for me. After a summer of everyone being home Adelynn and I will be together just the two of us. I'm not sure how this will be for her, to see those girls gone all day, having Mama to herself. Not that Adelynn is one for being overly sensitive to change; she has been so accustomed to change that this will likely be just another day for her. It's a new adventure for us. She and I are differnet this year. No longer a baby she has grown into a girl with a taste for being busy. This is the year we can get out and busy ourselves with activities. Perhaps meet some new friends. There is so many options I'm sure we will find plenty to keep us busy. I have big plans for just spending time outside. Walking to the park enjoying the fantastic fall this area so often experiences. Hello new school year we are looking forward to some fun!